One of the most nerve wracking aspects of planning a wedding reception is selecting the menu. Whether you are having a dawn wedding, afternoon nuptials or an evening service, the choice of menu for the reception takes some serious consideration. What you serve at the reception says a lot about you as a couple, and reflects the affection you have for your guests and the other members of the wedding party. Morning, noon, or night, the wedding reception should be a memorable occasion, and no one wants it marred by a mediocre menu. That really is the first question couples need to ask. It’s always tempting to want to provide food for your guests lovingly prepared by yourselves, or by friends and family. But this is a big day, and even if you are planning a relatively small wedding there will be a lot to coordinate. More often than not it is just too much for an individual, or even a small group of friends. Employing a catering service makes much more sense, and in the long run can actually save you money. While it may sound counter-intuitive, catering an event can actually be less expensive than handling it independently. Caterers are professionals, and understand how to purchase, prepare and serve an elegant wedding menu on a strict budget. Amateurs often find that their budgets take a beating as they deal with unforeseen contingencies. 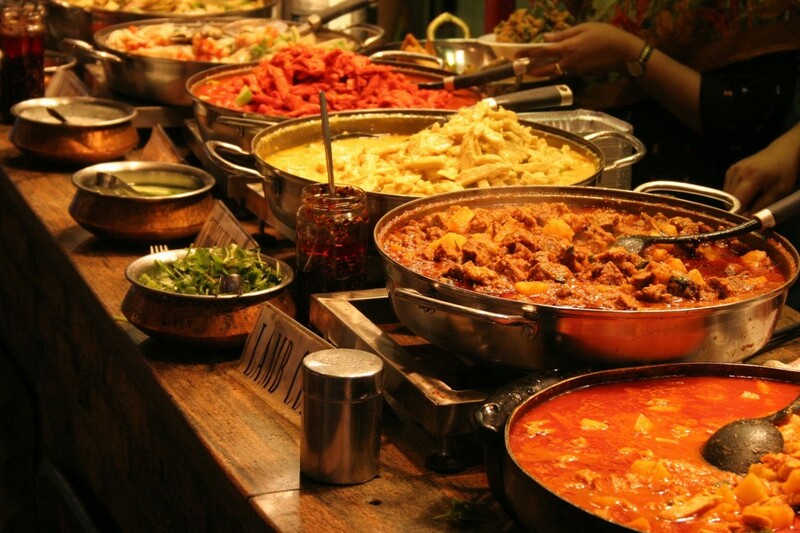 Once you’ve decided to go the catering route, it will become necessary to hire a caterer. This will take a little time, and couples will more than likely want to interview a few services before finding the one they are most comfortable with. If you are planning to hold your wedding at a hired hall or events venue, you may find that they have an on-site catering service who can handle all of your needs. In some cases, it may be possible to hire the venue’s on-site caterer as part of a complete wedding package that offers substantial savings over employing an independent contractor. If you are planning to hold your wedding at a church or synagogue, or even at someone’s private home, you will need to consider an independent off-premise catering service. If this is the case, the interview process is doubly important. You will want to be certain the company can provide everything you will need on the day, and that they have the transportation facilities to do so. Off-site catering also brings some menu limitations, and you will want to speak frankly with the catering chef about what can, and can not be, delivered. You will also need to consider dishes that can be prepared ahead of time, and that will travel well and still be sumptuous when it comes time to serve your guests. The choice of an on-site or off-site catering service will have some impact on your menu selections. Some foods simply do not travel well. Prime rib, lamb and seafood have a tendency to overcook when held too long prior to service, and this can make for a disappointing wedding meal. If you have chosen to employ the venue’s on-site caterer your menu choices will be greatly improved. With your menu selections prepared on-site, everything will be freshly cooked which will eliminate many possible menu disasters. You will want to work closely with the caterer to decide on a suitable menu for your guests. While the wedding day is definitely all about the happy couple, it is important to think about your guests and their enjoyment. Consider the general age of your guests, and make appropriate menu selections. For instance, older guests will tend to expect more traditional fare, and you may want to skew your menu accordingly. Younger wedding guests may be open to more adventurous choices, in which case you can work with your caterer to design a unique and playful menu that both satisfies and entertains. It is also important to keep in mind that some of your guests may prefer to avoid meat, and you should always provide vegetarian alternatives so all of your wedding guests are well taken care of. Planning the perfect wedding menu takes time and forethought, but it doesn’t need to be overly stressful. Think about the impression you want to make on your guests, and avoid taking on more than you can handle. While it is important to work closely with your caterer, it is also important to recognize that they are professionals trained to take your suggestions and to execute them with style and panache. Once you have made your menu selections, put your faith in your caterer and let them work their magic while you concentrate on preparing for the big day.